Sudden infant death syndrome (SIDS) occurs between 1 month and 1 year of age, with a peak incidence at 3 to 4 months. The cause is unknown, but may relate to delayed neurologic development. The rate varies from about 0.5 to 5 per thousand livebirths. 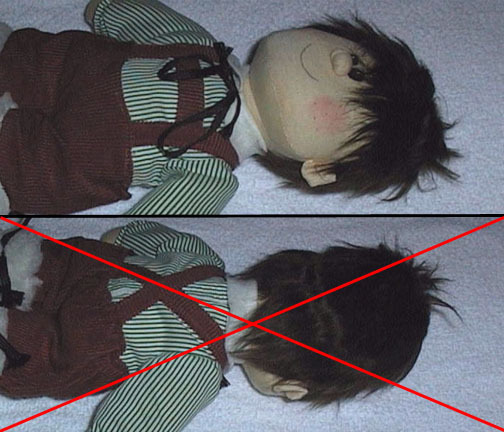 SIDS deaths can be decreased if the baby does not sleep prone, as shown here with the doll in the lower frame. The baby should sleep on its back.